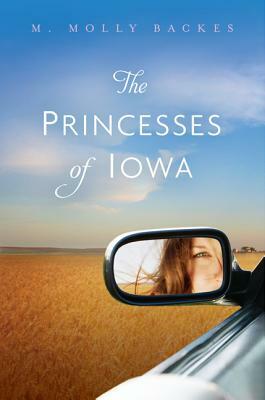 The Princesses of Iowa by M. Molly Backes. Grades 8 and up. Candlewick, May 2012. 464 pages. Review copy provided by my local library. Paige Sheridan has been looking forward to senior year for pretty much as long as she can remember, sure that she'll be elected to the homecoming court along with her two best friends Lacey and Nikki. But that was before a drunk driving accident that got Paige exiled to summer babysitter hell in Paris and left Lacey walking with a limp even after months of physical therapy. Suddenly, senior year is definitely turning out differently than Paige had always dreamed. Not all the changes are bad - a dreamy new creative writing teacher has Paige thinking more deeply, and new friends bring unexpected happiness. But can Paige the Princess fit in with this new crowd? Does she want to? The Princesses of Iowa surprised me by being more serious than I thought it would be. Several of my friends have read and liked it (sidenote: I have a surprising number of friends with strong ties to Iowa, it turns out!). From the cover and title, I figured it would be about catty mean girls and drama, and it was, but that's far from the whole story. The truth is, there's a lot going on in this rather lengthy novel and different plot lines are carried out with varying degrees of success. The characters are nicely developed and each stands out from the others. I enjoyed reading Paige's story, even though I didn't always like her. Even though she's a princess with a life that looks perfect to those on the outside, it quickly becomes clear that Paige has just as many problems as anyone else. Her mother is overbearing and controlling, trying to relive her own high school years. Paige doesn't really like her friends very much and she's ambivalent about her boyfriend. And Paige makes mistakes. She's mean to people sometimes and she speaks without thinking and she gets drunk and creates drama at parties. But through it all, once the accident and her summer in exile kick-start her thinking, Paige is learning and figuring out her mistakes and trying, trying, trying to make them right. That's the part that felt so real to me about the book. After the accident, Paige starts thinking more critically about everything. It's not something that happens over night, but over the course of the first few months of her senior year. Like I said, there's a LOT that happens in this novel and overall it felt like a little bit too much. Maybe an issue or two less would have been perfect. But I always believed in the characters and that's a definite selling point for me. I'd recommend this book to fans of contemporary fiction, particularly anyone with ties to Iowa, as my Iowa friends have commented that the setting was a big appeal factor for them. I'd hand it to fans of Lauren Oliver's Before I Fall for the similar mean-girl-wants-to-make-good plot line. And for kids who enjoy this book, I'd hand them Paula Danziger's The Cat Ate My Gymsuit (YES, even though it was a book I loved when *I* was a teen, which means it's "really old") because (no spoilers) there's a significant subplot where a beloved teacher is challenged by administration. Read more reviews by: our teen librarian Renata!, Jennie at Biblio File, and Kelly at STACKED. The Princesses of Iowa is on shelves now!